Whether you’re a roofing contractor, a building owner or even a politician, you’ve probably got one thing on your mind: energy efficiency. As energy costs rise and sustainability issues dominate the media, more and more industries are searching for innovative ways to cut energy costs and work sustainably. The roofing industry is no exception. Reflective roofing techniques are one of the ways in which roofing professionals and manufacturers answered the call for energy-efficient innovation. This kind of “cool” roofing involves using a reflective cap sheet to return the sun’s heat back into the environment. Reflective roofing systems also absorb less of the sun’s energy, keeping the inside of a building or residence cooler and reducing air conditioning costs. They can also increase a roof’s durability. Exposure to heat and ultraviolet (UV) radiation from sunlight can affect roof covering durability, and using a material that reflects UV radiation from the sun will reduce the damage it causes. Reflective roofing was an immediate choice for both the architect and building owner, according to Julio Martinez, president of Precision Roofing Corp., the company that installed the roof. The roofing system for the 60,000-square-foot Doral government center consisted of multiple roof areas, including lightweight insulating concrete that used a nailable venting base sheet, three plies of premium glass ply and an innovative asphaltic roofing product, GAF’s GAFGLAS® EnergyCap™ BUR cap sheet, that exceeded reflectance requirements. Because the coating was applied in an in-line, single manufacturing process, the Precision Roofing team utilized a cautious mopping technique. After its completion, the new asphalt roof at Doral City Hall went on to gain positive recognition. Earlier this year, the municipal project received the asphalt roofing industry’s top honor — the Quality Asphalt Roofing Case Study Awards (QARC) Gold Award. The annual QARC awards program is run by the Asphalt Roofing Manufacturers Association (ARMA), and recognizes roofing projects that demonstrate the energy efficiency, durability, reliability and affordability of asphalt-based roofing products. Doral’s new energy-efficient municipal building demonstrates the growing trend of reflective roofing systems in North America, particularly on government buildings. Many state governments have adopted new codes that require certain roof reflectance standards. Miami, located only 20 minutes away from Doral, was one of the first major cities to adopt high roof reflectance requirements in order to reduce heat island effects in the city and lower energy consumption. The Miami 21 Initiative, launched in April of 2005, gave the city one of the highest roof reflectance requirements in the country. Since then, many municipal buildings in surrounding cities like Doral have been re-roofed and reconstructed to meet and exceed both reflective roofing and LEED requirements. The reflective cap sheet used on Doral City Hall was specifically constructed to exceed the reflectance requirements of Energy Star, Title 24 and the Miami 21 Initiative. Roofing contractors in Florida can also take advantage of different roof incentive programs for building owners that offer rebates for roofing practices that reduce energy costs. These kinds of incentives are available in many other states as well. In the near future, roofing contractors may have an even bigger incentive to utilize energy efficient techniques like reflective roofing. In the spring of 2014, the Energy-Efficient Cool Roofs Act and its companion bill, the Roofing Efficiency Jobs Act, were introduced in the Senate and House of Representatives. This legislation would introduce incentives for companies to build new cool low-slope roofs on existing commercial buildings by shortening the depreciation schedule for the installation of reflective roofs that meet energy efficiency and insulation requirements. Not only would energy-efficient commercial roofing systems become more feasible, they would be encouraged. For more information on this proposed legislation, visit www.congress.gov and search for S. 2388 and H.R.4740. 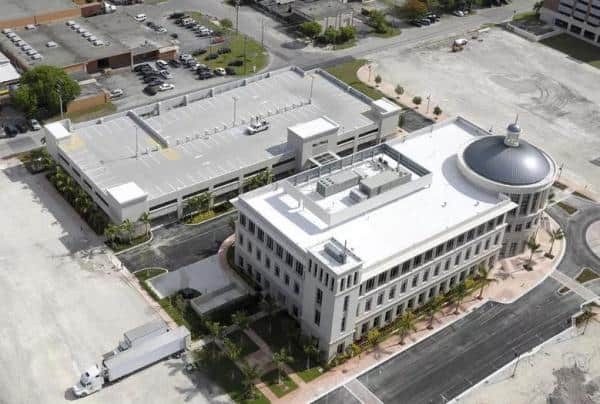 Other roofing companies will look to successful projects like the Doral municipal building when their state’s reflectance codes change, or when they want to take advantage of energy-efficient roofing incentives. For more information about the Doral City Hall project, the QARC program or asphalt roofing, visit ARMA’s website, www.asphaltroofing.org.